Thank you Chantal. Yesterday and Saturday we rode with Heather Blitz. He did pretty well on Saturday and then Sunday Heather told us we were going to take it up a notch. Let's just say Junior wasn't really sold on the idea but by the end of the lesson he was moving and working in a whole new dimension. I have my homework cut out for me and I plan to ride with her when she returns. I feel that if I can succeed in accomplishing what she assigned we'll have a really good foundation for the journey ahead. I was soaked and so was he by the end of the lesson; but, he was a much more willing participant and I think he understood the demands being made (and yes they were demands - I did succeed in breeding one with TRUE PONY CHARACTER...LOL). I have a schooling show next week end and I think I'm going to stick with the plan Heather laid out which means I'll likely score low at the show but will have an opportunity to really set the stage with the hopes that it will come together with some consistency by the recognized show in November. We shall see! Exvet, may I ask what she requested in 'taking it up a notch'? That's what is happening in my lessons too. Shorten the reins and push into the content. None of this soft long rein lackadaisical stuff. And yes, wet undies and horse after a ride. LOL, yup that is exactly what I'm talking about......and the true test was it was easier and more consistent in terms of the acceptance and improvement of self carriage - today. Heather was pretty clear in that she was telling me to train/teach him what I want with respect to contact (no matter what) and stepping up into it with a yes ma'am attitude. That is whether it's a 2 or a 10 in terms of degree of contact ( 1 =barely there -10 =strong but accepting, in terms of weight in the hands), he is to accept the contact and do so seeking the hand, with energy forward, reaching over the back and recycling the energy. What brought it up was me explaining at the beginning that I new he felt willing and happy to go around in an easy going frame but that he was NOT truly lifting in his wither yet and I felt like he was plenty strong enough behind to start. She agreed. What was clear is that he was fine with light even steady contact but I have a bad habit of going lighter in the contact when he started to back off/resist. Even though I was always successful in keeping him in a light, forward reaching contact, It was time to help him understand that at times a 'heavier' contact is okay because it's more effective in rebalancing him and he can still be supple and over the back. In her words it is the only way to get him to step under and take more weight behind and recycle the energy over the top line. I of course would not/should not have to always ride with that heavy of a contact but as we go up the scale it will be necessary to do so at the appropriate times. 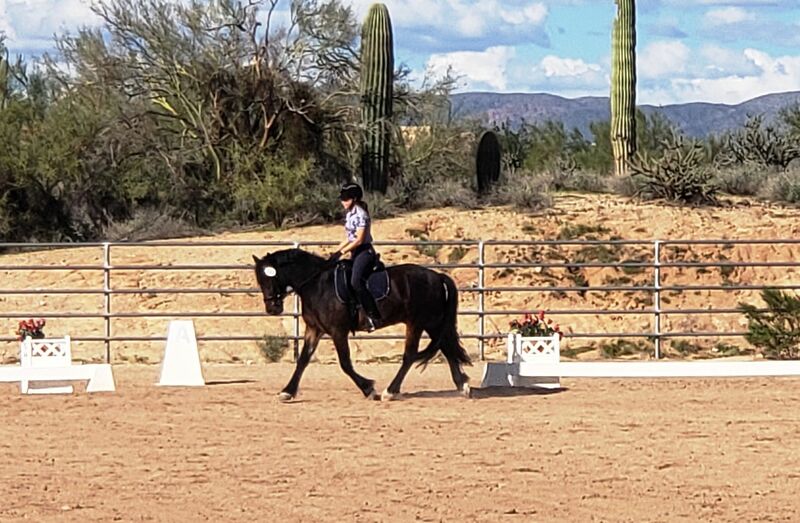 If I'm introducing the canter pirouette and need to use a bit heavier contact to help him and teach him the concept, I don't want him to back off or resist that heavier contact but to move forward into it accepting my request for more engagement and self carriage. It is also very important and only fair to point out that this isn't and wasn't to be done in a vacuum. I have a capable, ever present seat and leg. I told her up front my concern was that I knew I had to do this but I didn't want to pick a fight or teach Junior that he could win a fight. She basically talked me through the uglies and encouraged me to be persistent but fair with the leg (and at times whip) to help him understand what I was asking. When it was good, it was really, really good and he moved like a completely different horse. The test, which he passed, was that even with the 'stronger' contact and better frame I could move his head/poll and put it however low or high I wanted. He was supple in the jaw and moved forward into the hand with seeking intent. Of course we were exhausted at the end and now I'm going to see if we can get to that point that it isn't exhausting or an issue/novelty. The real key for me was that it was okay if the exercise turned into reinback for however long it took for him to accept the contact and soften and then he could move forward. The other key for me was that I had her eyes on the ground to insure that we were working back to front and not backwards. The goal was to not allow him to shorten the neck or sink all his power into the base of his neck which for my breed is oh so easy. I hope that makes sense. Sounds a lot like my lessons, except my horse is much older but got a late start. Are you saying you are happy if the exercise turns into reinback? Sadly, my mare does not understand reinback yet, and my trainer isn't asking for it yet (for whatever reason). I'll wait. I certainly do not want the horse to reinback to avoid the contact. As you know, that can lead to rearing. While I don't have a pony, my horse is pony-like so probably closer to your pony than to the others horses on this fourm. How is your guy with stepping into the contact a walk on the shorter rein? That is my issue. 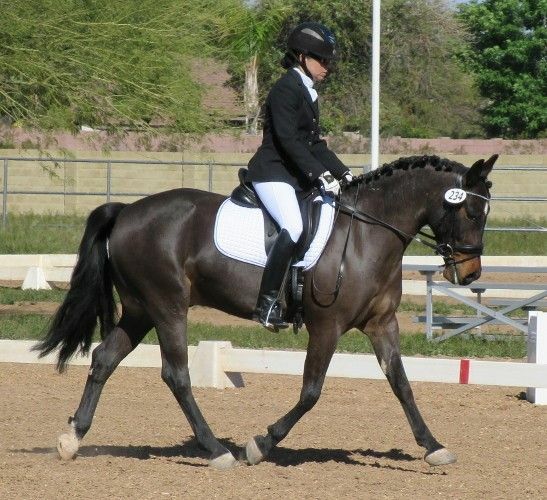 My mare is quite good at moving into the contact at trot, moderately good at canter, and poor at the walk. She will accept it, but then lose quality of walk, get tense, or think I want to trot. Like you, I think while getting this good foundation it is very helpful to have someone good on the ground to make sure we are not working front to back and other sins. 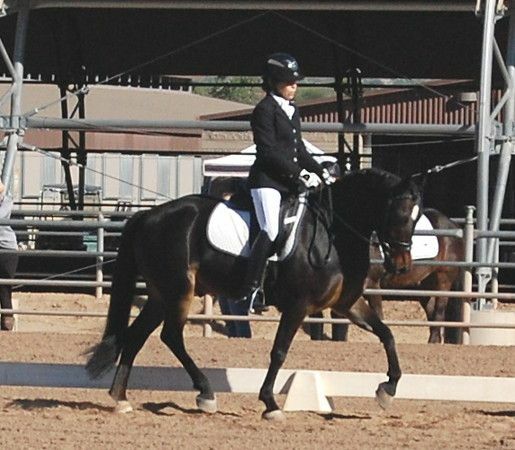 The rein back exercise is intended. It's not like a competition rein back but the purpose is to get the desired contact and the desired balance. If he cannot achieve it going forward and insists on going backwards then so be it. The key point is that I'm not going to be suckered into relaxing the contact. I am aware of the possibility for rearing. He's already tested that envelope. This is the specific reason why I have eyes on the ground and am not simply doing something that I read in a book. Those eyes are credible on an international scale. To answer your other question, my pony at first was very resistant to walk forward on tighter contact with acceptance and proper balance/posture; but, he eventually accepted it and did so again today. There is no overbearing punishment or negative reinforcement and lots of praise when he gets it right. It could go either way right now but so far the light bulb is definitely flickering with true promise of going on and staying on. I am not recommending to anyone to do as I do. I shared what you asked me to share. No one has to agree with me; but, I respectfully ask that the gallery not weigh in with the typical gas-lighting that occurs here and on other boards. It makes complete sense. I've had lessons similar to this and wow, my instructor has me ride levels above where I ride. Consistency much? Then again, I was only riding 2 days a week (other people's horses...). So cool, more pics and updates please!! Great updates, Exvet. Thanks for taking the time to share Jr’s training. I personally have a lot of respect for your approach. Your seat, position, trainer, pony....it’s all good. The fact than you can explain what you are doing is icing on the cake. Reading your latest update makes me want to go out and ride! Thanks everyone. I hope to get to ride on Friday and then it's the schooling show on Saturday. Between work, needing to take my mother for her diagnostic tests on Friday and the fact that my father is in hospice, all has to take priority right now. It is so nice to have a pony that has such a good nature despite his ponytude. 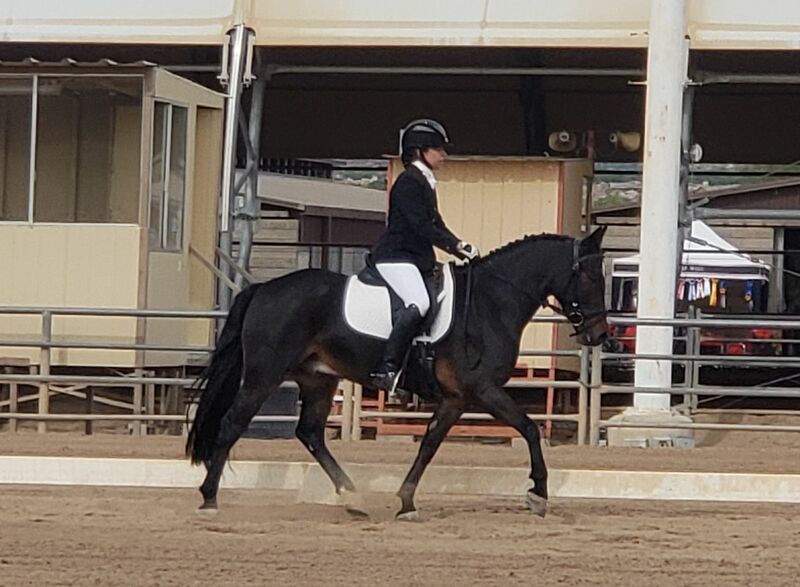 I will likely not have a chance to ride the training level tests before the show and will just wing it; so, if I'm not otherwise in dispose the schooling show will have far more emphasis on schooling and be a place to mentally escape from the reality of life. Treating the show as a mental vacation will hopefully translate into a fun, relaxing outing for Junior and transition into better experiences in the future. Again, we shall see. So we managed to survive the schooling show. Actually other than some challenges with the canter and canter departs which I expected and some initial tenseness that improved/lessened with each of the three tests we rode, I was very pleased with Junior. We had only one ponytude moment. Of course with the tension that was introduced at the show our work on contact decided to take a swing towards trying to duck behind the contact and some BTV moments; but, I did NOT throw away the contact. I already saw improvement when I rode today. We started the show with a 63 on our first test and improved our score to earn a 65 and change on training level test 3. The judge commented on Junior's expressive movement in a positive way......I actually got good comments on my welsh cob's movement!!! where the term expressive wasn't a back handed compliment. The judge was dead on with her suggestions that he needs to improve his strength in the canter departs and canter. As we achieve and keep true contact with him coming over the back more, I'll be able to help him develop the strength he needs. He's definitely a keeper, YAY!!! The judge is a keeper too! I'm so happy you got good feedback Junior (and you) deserve the kudos -- you make a great pair! Thank you. Here is a video of our first test. He was tense but not in a scary way. He has started to duck behind the bit a little but I think we're getting that nipped in the bud. Our stretchy circle wasn't so stretchy for the first test but we scored a 7.5 for our stretchy circle in test 3 redeeming ourselves. My daughter and her boyfriend offered to video tape my last ride which I declined. Now, I wish I had it since it was the best of the three rides. Oh well, any way here's the good (we survived) and the bad (lots of work needed on acceptance of the bit in all strides and improving his strength). He's still a keeper. Thank you Anne. I was grateful that he wasn't too distracted by the other horses. I met an acquaintance of mine who I hadn't seen since she acquired a new horse. It is a grey Arab, not the one in the video. Junior took an instant liking to him. Fortunately he's not one to be too vocal when other horses leave his area; but, he sure made it clear that he'd like to get to know him better, LOL. milestones = first bath, first body clip and first time wearing a stable blanket/sheet - successful! set backs = did rear (and an impressive hi-ho silver away type) at my insistance to accept the contact BUT did not repeat it and followed through with 3 satisfactory trot to canter transitions without even a hesitation or offer to rear.......we'll see if we're able to continue to move forward. On another good note, his true rear is balanced and demonstrates plenty of strength - not scary - but nonetheless unwanted. We achieved our first recognized show! 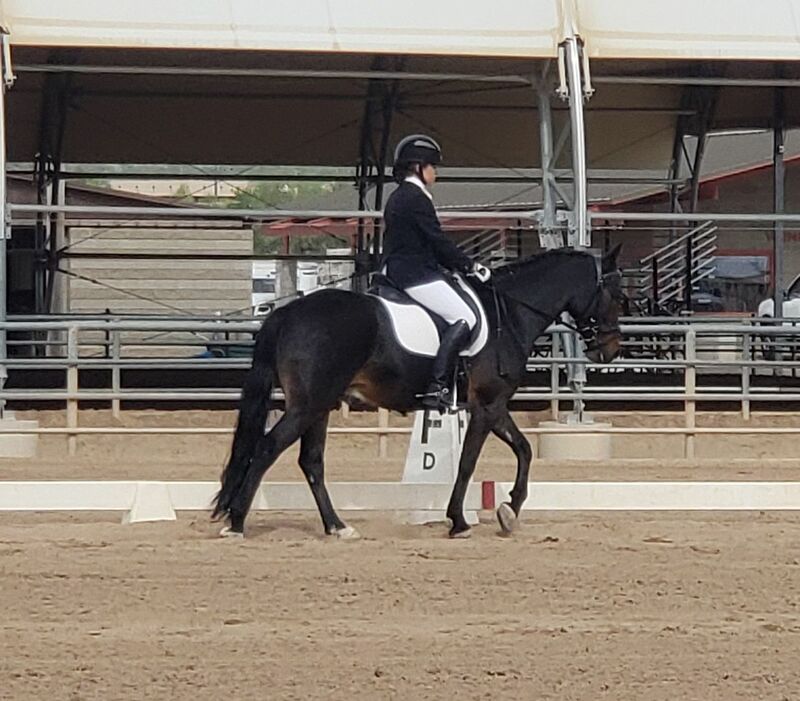 Of course I must first confess that we showed in the opportunity training level classes thanks to the recommendation of the show secretary; but, to that end we did at least 'earn' our two of four 1st place finishes in that we actually had competition in the classes today (LOL). 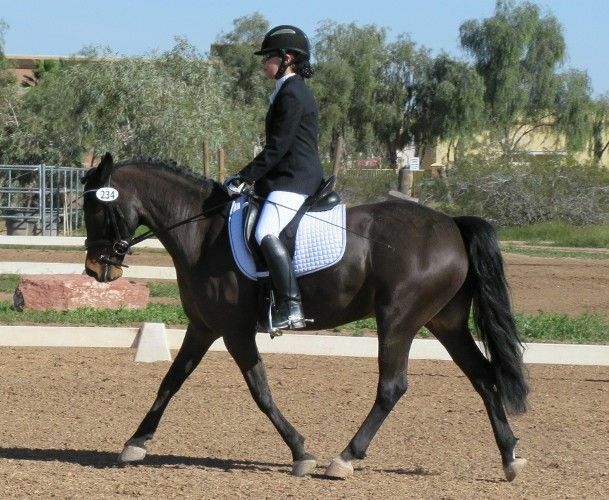 In any event, despite some tense moments and the obvious need for more suppleness we did have quiet, obedient, and for the most part accurate tests. The scoring was a bit sparing the whole show and yet we still ended up with scores from 63 (for a test where I made an error of course) to 67 for the total of four training level tests (4 blues and 4 wine glasses as prizes to round out the collection). Junior was overall a good egg. 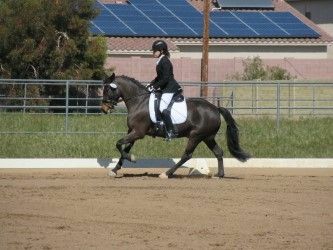 We definitely need to build more strength and develop better suppleness and per the main judge, improve the looseness over the topline to achieve better movement/gaits and scores. Still, I'll take what we got any day of the week. I am over the moon with Junior and his debut. exvet wrote: On another good note, his true rear is balanced and demonstrates plenty of strength - not scary - but nonetheless unwanted. Great showing! I'm impressed at how much he seems to have improved from the first show to the second. Just comparing the still photos, he looks far more relaxed and confident. He's not always thrilled about stepping up to the plate and in the warm-up at one point on Saturday he took it into his head that running through my right rein and trying to take off was the way to get out of my requests. 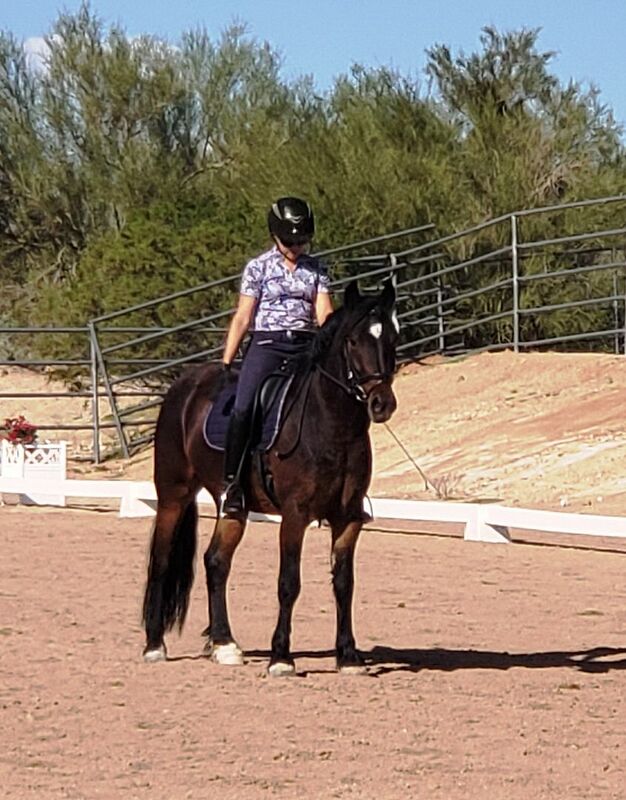 I use to be able to just muscle through such episodes; but, three times running him into the fence (I have lost a good 25% of the strength in my right hand/arm) alarmed him enough to just plain stop and start respecting my right rein a bit more. It's definitely building character. Ah the old take the rein and blow through the shoulder deal, not fun (Rip was a master at it). I never felt comfortable running him into the fence though, Mark often suggested it, but Rip is jumping bred and I have seen him hop over my fence before!! It took some time to eradicate but finally did. A very solid intro to showing. Yes, those young ones can be challenging in such an atmosphere but it sounds like he got it together. It certainly looks like it in the presented pictures. Congratulations. It is so gratifying to bring these babies along although my dear made her debut when she was 8! But the result was the same and I was so happy. Well this is from the first test on Sunday. He was definitely a wee bit tense and trying to avoid the contact at times or going against the hand, especially trying to blow through my right hand. Though loads of room for improvement, I'm still happy with the performance Junior put forth. The score improved by the second test of the day and definitely had more relaxation - no video though. He looks great! Nicely done! I get the running through the rights shoulder from my guy. We are getting much better, but I can imagine in a show situation going back to it. You both look great, thanks for sharing. Thank you Chantal. It's a fun age. Looks like you're rolling full steam ahead with yours as well. 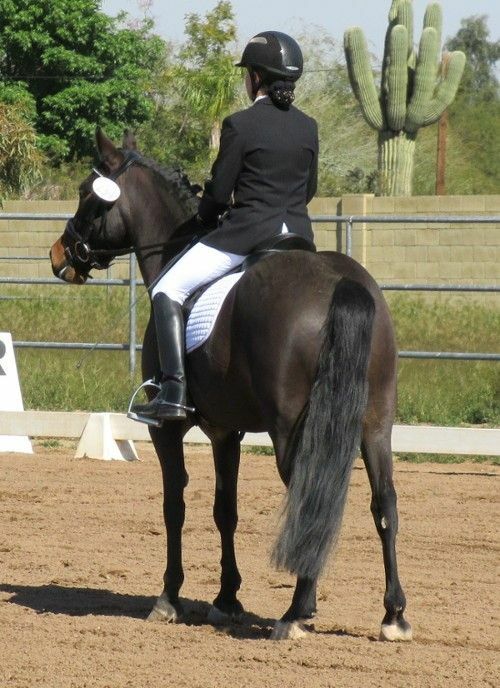 I like how well your horse is developing muscle through his hind end/loin based on your last pictures. exvet wrote: Thank you Chantal. It's a fun age. Looks like you're rolling full steam ahead with yours as well. I like how well your horse is developing muscle through his hind end/loin based on your last pictures. Oooh, thank you! He uses his hind end really well. He's so young that all his bad habits are going to be ones that I've allowed/created. But it's awesome having this clean slate to work with. I'm very fortunate to have a great team of people helping me. I'm not experienced enough to do this on my own. I just love his brain. We moved to hopefully our long-term home 3 days ago and have had 2 good rides already. Being a little careful as he was kicked in the hock in the field, so taking it a little easy for a few days. But he's his typical cool self and rolling right along like he's been there all along. It is a fun age! Um, with the right horse. He was started very well, there is that. 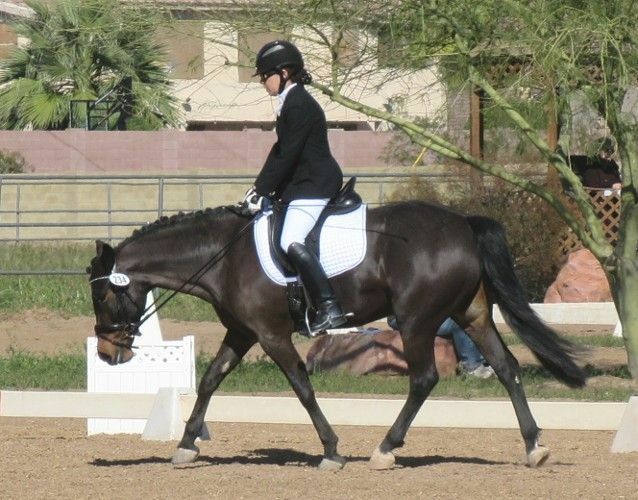 I give full credit to his trainer, and spending a month and a half at her place was awesome for us. Nice test and good catch on the left lead exvet! Jr looks very composed though for such a young guy in a show atmosphere. I appreciate the support khall. Linden, this one is pretty neat in that he's got a similar character and personality to Monty (who you saw in Flag) but is better built for the sport. We'll see if that makes a difference this time around the block. Yesterday we rode 9+ miles on the trail, which was beautiful btw - perfect weather, mostly walking and some trotting. Today I rode in my neighbor's roping arena (huge area) and worked on the canter departs with Junior. I could tell there was much improvement just from last weekend. I also found him far more accepting and less questioning of the contact (lots of time to work it out when you trail ride for 9 miles and forward march was the only thought on Junior's mind.) As I work on improving his strength to carry and develop more power, I feel these issues will resolve in due time. Because I finally had more time to download some additional photos, here were some of Junior's better moments last weekend. Junior's got a great shape. You're right that trails can do wonders for sorting out contact and things - there's much more natural forward energy and it's so productive for the mind. Wow---love the additional photos. It makes sense to me that trail time contributes to clarity. I'm a big believer in that. I love trail time too, doing as much as I can with my guy. I love these pics, Junior looks great. What a fantastic guy and pair!! I love him, exvet. Trying to read every single update in the thread. So happy you have this boy. exvet wrote: He's not always thrilled about stepping up to the plate and in the warm-up at one point on Saturday he took it into his head that running through my right rein and trying to take off was the way to get out of my requests. I use to be able to just muscle through such episodes; but, three times running him into the fence (I have lost a good 25% of the strength in my right hand/arm) alarmed him enough to just plain stop and start respecting my right rein a bit more. It's definitely building character. is this a cob thing? because my silly boy has done this as well. Perhaps. It's not the first one I've had that's done this. To be fair though one of the others was a welsh cob x morgan cross. I don't think it is just related to breed but can be a young horse thing. My Oldenburg g did this for quite awhile until we could finally get it sorted. Running him into a fence was not something I wanted to try since I have seen him pop over my fence before. Rip was quick about it, would throw the head up and out the right shoulder. I had absolutely no fear that Junior would try to jump the fence that I was aiming him at because of how it was structured as well as it's height. Not all fences are equal But for argument sake, .... running into a fence might stop them and it might not; but, if it slows them down and makes them roll back on their hocks and jump and gives me an opportunity to adjust their balance....I'm not opposed to that. I have a decent chance of staying with them and believe it might still serve as breaking up their steam roll attempt. I come from a jumping background and knew no fear when I was actively competing. The welsh cob x morgan cross I referred to above was like a cat going over fences.....I didn't point her at a fence unless I was either wanting or prepared to take it full on.....I also had her at a time I had full strength in both arms and could one-rein stop just about any horse so I didn't need to run her into a fence when she made her initial attempts to freight train through my outside rein. I am no longer able to do that. The trainer who started Maia is a Buck Brannaman accolyte, and she taught the mare to disengage her hind end. Basically, you combine a one rein stop with a haunches out (Buck starts doing it around 1:05 here). 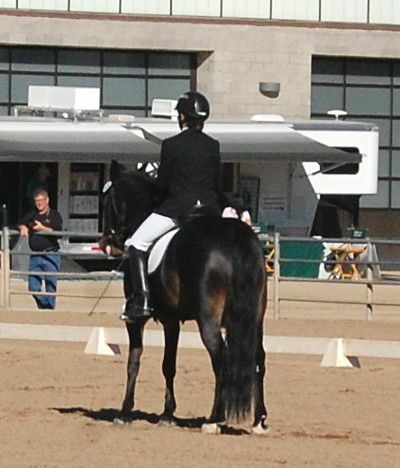 The trainer taught it to me (and Maia, pror to starting her) on the ground, then showed me under saddle. I have significant loss of strength in my left arm and right hand, and even if she's being unusually hard headed (Maia's normally cooperative and sensitive to my legs), I can pull this off with minimal brute force, and far more leg than hand. I know I now sound like a Brannaman accolyte, but his ground work has been great for this mare. I knew roughly what I was going to be riding because I have both of Maia's maternal elders, and they're hell on wheels as youngsters. Heddylamar, I"m familiar with the process and would happily use whatever works at that moment, not caring whose name is attached. I have used it in the past and have an extremely strong left leg. Unfortunately due to my physical limitations, not just loss of strength, I am not effective at all times with this technique. I did try it. I was not successful; so, I had to try something else. There wasn't enough time to repeat the same thing over and over in hopes of achieving a different reaction. I am more than comfortable running Junior into fences of a specific height/construction. Fortunately it has only happened at that one show. It proved effective when other methods did not and I was in an arena with very young children on much smaller ponies. I appreciate the suggestion and am VERY aware of the potential consequences of my selection of methods in handling my horses. My physical limitations do not come from any mishaps sustained while working with horses and 100% from working long hours doing repetitive motion in accommodations that were more along the lines of third world countries/mash type units. I am quite capable of handling myself and my horses knowing my limitations. I appreciate and understand others' choice of methods and do not deem them inappropriate or criticize the decisions especially if they worked. My velcro is still very much intact despite my other shortcomings and boldly running a horse into an object it does not want to run into given all the other appropriate choices/open doors I gave it, isn't something that phases me while on this welsh cob. I know what he will and won't jump and I would never point him at something I thought he had the most remote chance of running through either. If someone wishes to discuss how to handle running through the outside rein on the training board to provide others with what they deem are more appropriate methods to handle this issue, I invite them to do so and will refrain from discussing my methods. Oh yes. Do whatever gets the job done quickly! I apologize if my post came off as a criticism, it most certainly wasn't intended to be. I was just sharing another method from my toolkit -- we can't have too many methods to stay intact, in the saddle, and keep our horses and others safe! No worries. You did not come across as criticizing. I too agree that the toolbox must be bottomless because there is no end to the individuality of horses or circumstances. I think the topic is a valid one that could benefit many. I have learned over the years, however, that while my circumstances are not in any way unique, it's best to make sure that what I share is in no way intended to encourage others to do as I do, so-to-speak. This is why I don't post often in the training forum or the veterinary forum. I don't mind sharing my personal experience but I in no way want to be seen in the forum venue as giving training or vet advice. I answer questions when asked directly as best I can; but, my answers should not be taken as ones that are to be followed, just a reflection of what I chose to do at the time. I am well aware that I dance to my own tune/march to my own drum. I like that you and a couple others have a thread dedicated to your horse. It's nice to be able to follow the progress. I wish they would do that on the training forum. I've suggested it, but nobody was interested. Linden wrote: Junior's got a great shape. Any idea what she meant by this? I think I know, but I'm not sure. I think she means that he is built nicely round from head to tail. He reminds me so much of my mare. She's a 16h version of him. It was a very nice test, and especially so being that he's so young and first show. Thank you MC. I'm guessing that she meant he's three equal parts but we'll have see if Linden will clarify. I am very attracted to his type, taller or shorter; but to be honest I can't imagine riding a taller version. He's the right size for me because he's personality is much bigger than he is. I'm not sure that I at my age I would want that in a bigger package. I had a lesson today. We worked on having him really step into the contact and take the weight on his hind end. He handled it pretty well. 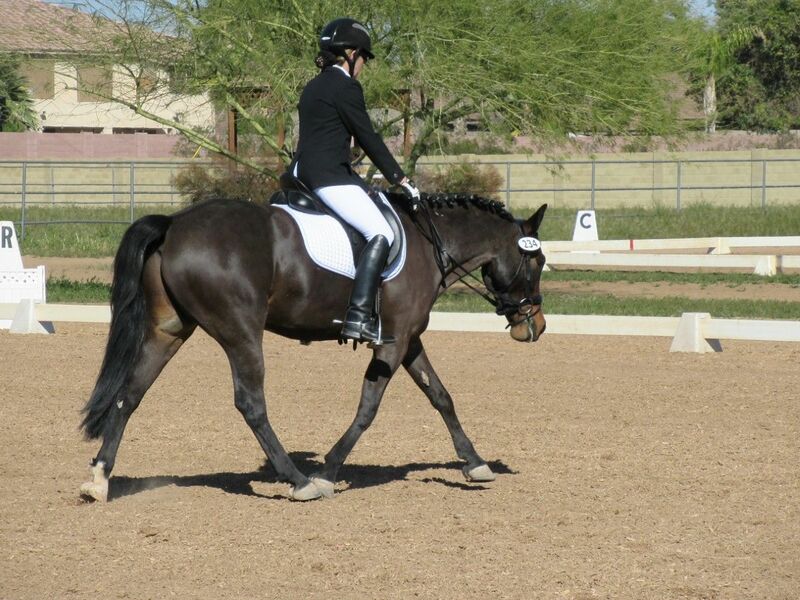 I got some really nice canter and much better canter departs as a result. Getting him to shift his weight back and step into the contact definitely freed up his shoulder which was nice. The best part was just riding a balanced horse instead of a hectic mess underneath me. He showed me today that he's got the strength for it and it didn't blow his mind. It's what we'll work on for a while before ratcheting it up another notch. 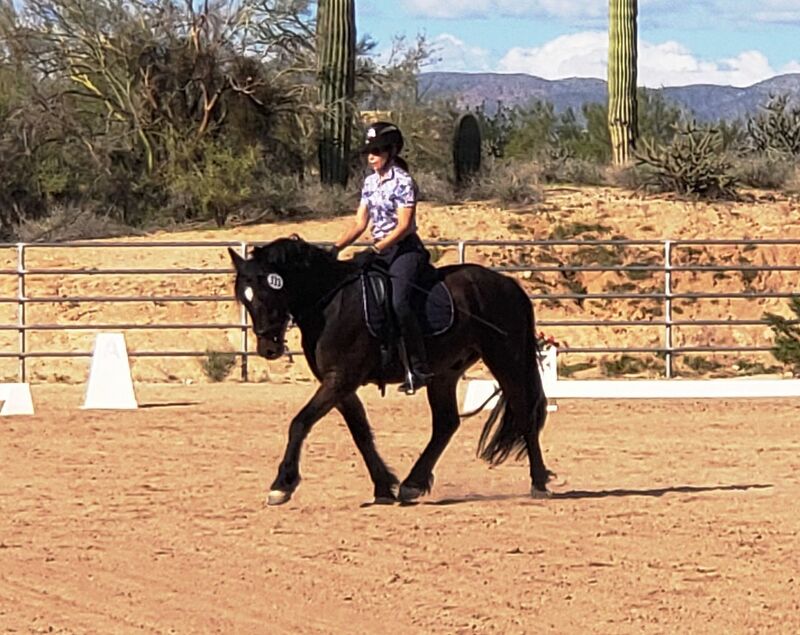 Transitions, transitions, transitions.....the balance it develops really makes it easier to have a more neutral contact, a relaxed seat and a light horse even if, for now, it's embodied in a few strides at a time or 1/3 of a 20 meter circle. It's at least a place to start. Here are pictures of 'my boy' from the latest recognized show. It was Junior's second recognized show. He is just shy of his fifth birthday (next month). We rode training level test 3 in front of two well known 'conservative' scoring judges. All I can say is that I was so pleased with his performance, less so with my riding/form. That being said it was a successful day. Here are some pictures my daughter captured. I just wish I wasn't getting into that old habit of leaning forward to get the longer stride. That will be what we work on moving forward, developing power from behind and not with 'my' help by mistakenly leaning too far forward. Still, my coach/riding instructor seemed to be pleased. Yup, no longer the rider I was; but, I still got up this morning and threw down 6 surgeries and saw another 22 appointments. Not in the grave yet........LOL, and have tomorrow off; so, we're going to trail ride and just have fun. 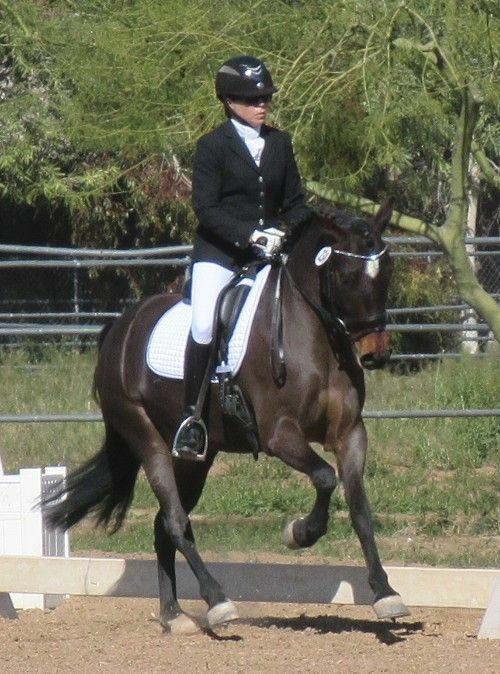 Hope to show in April and will show first level after the scores this weekend. 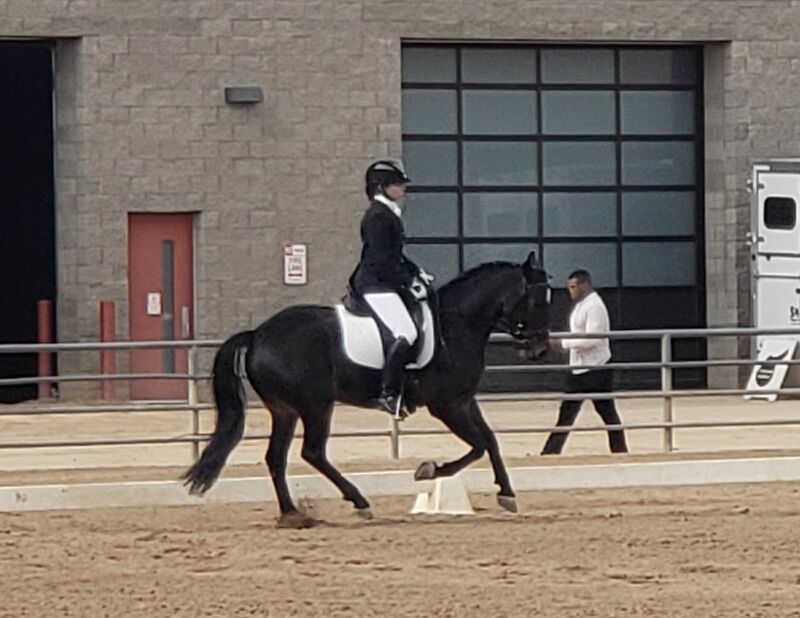 Those on the OTOB as I'm sure here like to refer to me as condescending..........yup, yup, yup.......honestly I hope those who love and believe in what they ride see dressage as a tool to advance, make themselves and their horse better. That is really the gravy to having a healthy, happy horse and enjoying living most every day. He looks like a totally different color! What a chameleon! Ponichiwa - Jr's dam is a sooty buckskin with minimal white and his sire is a sabino/splash bay. Junior did not get chrome that most do except for 'that' star which is sire stamps on each of his. However, though I don't think they've developed the genetic testing for it, I do strongly suspect he inherited whatever alleles create the sooty coloring. It appears to be dominant at least with the 5 foals this mare has produced (3 for me - all dark bays, 2 for another which were sooty buckskin and these were by two stallions, both sabino/splash bay). Junior, like my original stinker pony (also sooty buckskin), have many colors to them especially when I body clip. I was always asked what color the stinker was/was supposed to be. I also think the color difference seen in the pics has to do with the fact that I didn't get to bathe Junior before this show, too cold. He's also doing more sun bathing these days. 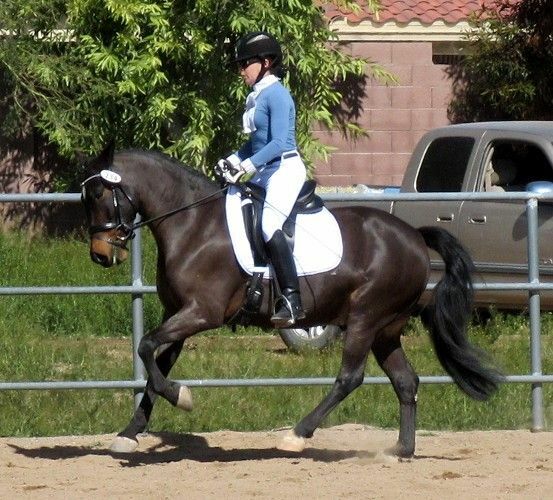 With Junior I don't get asked about the color, just about the breed especially when they see his 'expressive' canter. This time around, lol, the expression is in the front end and not an undesirable trait, just lots of scope. Congratulations on your successful show exvet, you guys look super! Happy Birthday Junior! Well Annwylid Dare to Dream turns 5 today. It's hard to believe that 5 years ago I delivered his little orneriness! He was cussing me out when I slid him to the ground and he still talks to me all the time, giving his opinions. He's turned into a good egg even with his strong Welsh Cob opinions. 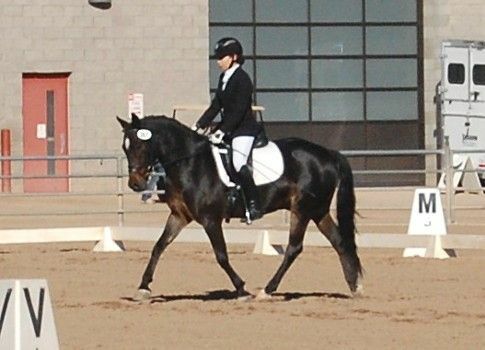 Here are pictures from our last show where he scored an 8 for his stretchy trot. Hoping we do as well at our first level debut next month. So, so glad I was able to keep this one.